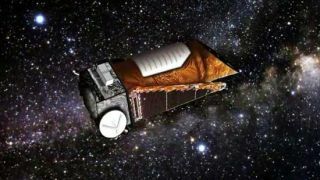 NASA unveiled a wealth of new data from its planet-seeking Kepler space telescope today (Feb. 2) - observations that significantly increase the number of possible alien planets and identify potential Earth-size worlds, including 54 planets that could be habitable. To date, more than 500 alien planets outside of our solar system have been discovered, but that number could more than double if all the candidate exoplanets from the new Kepler data are confirmed. Amid the 1,200 possible alien worlds, Kepler has already found 68 potentially Earth-size planets. "We went from zero to 68 Earth-sized planet candidates and zero to 54 candidates in the habitable zone - a region where liquid water could exist on a planet’s surface. Some candidates could even have moons with liquid water," said William Borucki of NASA’s Ames Research Center in Moffett Field, Calif., the Kepler mission’s science principal investigator. "Five of the planetary candidates are both near Earth-size and orbit in the habitable zone of their parent stars." The new data also reveal that smaller worlds and multi-planet systems may be more common than previously thought. The data release is based on observations conducted between May 2 and Sept. 17, 2009. Kepler's planet candidates by size. "What's incredibly interesting is that they're now going to give us a list of small planets," said Lisa Kaltenegger of the Harvard-Smithsonian Center for Astrophysics in Cambridge, Mass. "Some of them could actually be in what we call a habitable zone. If they were rocky or if they are rocky, they have a potential for being habitats." "We can learn a lot about planet formation and start to understand how these systems form," Kaltenegger said. "So far, we only have our own system, so the more samples we have, the more we can learn about how planets form, how they move, how they migrate." NASA announced the planetary discoveries during a press conference today. The Kepler spacecraft is the first NASA mission capable of detecting Earth-size planets in or near the so-called habitable zone – the region in a planetary system where liquid water can exist on the surface of the planet orbiting its host star. Kepler's planet candidates as of Feb. 1, 2011. Although additional observations are required over time, Kepler is detecting planets and planet candidates with a wide range of sizes and orbital distances to help better understand our solar system's place in the galaxy. During a scheduled contact with the planet-hunting telescope yesterday (Feb. 1), engineers discovered that the spacecraft was in safe mode, with its photometer and star trackers powered off. This is a self protection mechanism that the spacecraft enters when something unexpected occurs, and Kepler is currently rotating along a sun-aligned axis with its solar arrays pointed at the sun. Analysis of all spacecraft data indicates the subsystems remain healthy, NASA officials said. Engineers have begun the recovery process and are evaluating data from the spacecraft subsystems to determine what triggered the safe mode.